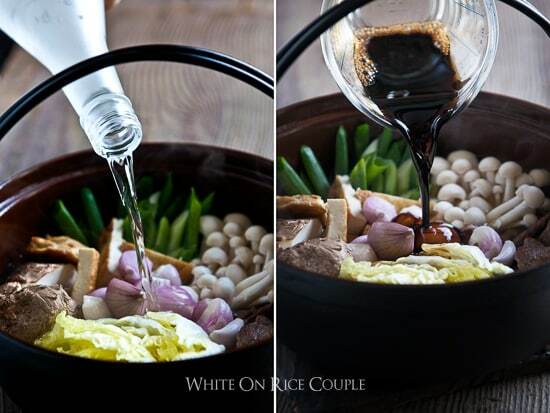 This Beef sukiyaki Japanese hot pot recipe is inspired from a great cookbook called Japanese Hot Pots. Japanese hot pot, or nabe, are the perfect dish this time of year. Quick, easy, and warm one-pot meals. Beef sukiyaki dinner. Before and After. We’ve been trying to catch up on our unarchived photos and after going through our recent Japan trip photographs. We were craving some Japanese deliciousness, and quick. 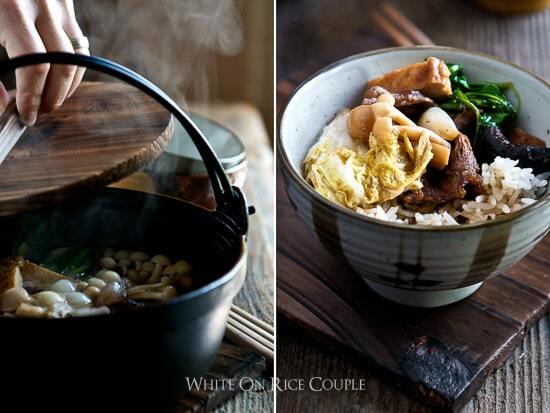 What better way, than with some warm, comforting Japanese home food, Nabe, or hot pot. What is Nabe or Hot Pot? In restaurants here in the US, most people’s experience eating Japanese hot pots are at a Shabu-Shabu restaurant. You might consider shabu-shabu one of the more refined versions of nabe, where the flavors are often delicate and subtle. The finest cuts are of meat and highest graded seafoods are served, with most everything sliced paper thin and raw. Then you will quickly poach the meats in a delicate broth. Nabe is quintessential Japanese home cooking. And home cooking, no matter the culture, is always some of the best cooking. Comforting, delicious, simple and satisfying. They are the type of dishes which comes from the heart and soul of the Japanese. Shabu-shabu is one form of nabe, but there is so much more to Japanese hot pots than shabu-shabu. For those uninitiated to the pleasures of Japanese Hot Pots, they are essentially one-pot meals where the ingredients are all poached in a broth. After cooking, that pot then becomes the serving vessel upon which everyone gathers and shares. For us it is the ultimate way to eat. Few connections touch closer to the human heart than sharing a meal from a singular nucleus. It’s one thing to sit down at a table together, but another, one endearingly more special, to share from the same plate or vessel. 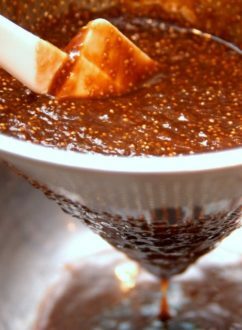 The Japanese hot pots share a simple and easy formula. 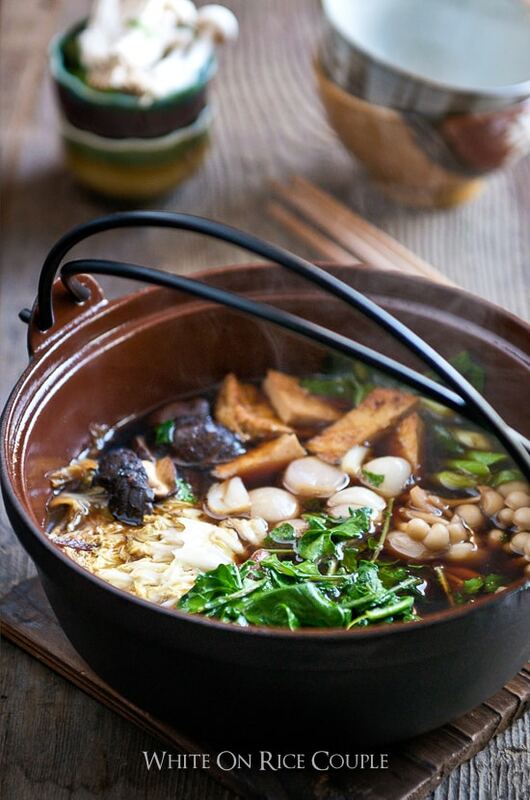 Prep the ingredients, make the broth (most nabe broths are quick to make – not 3-5 hour stocks), neatly gather and fashion the ingredients into the pot, then cook. The cooked ingredients are communally eaten, then the remaining broth is often consumed with a comforting and filling shime or “finish”, often cooked rice or noodles. Like most any culture’s home cooking, the ingredients are nourishing and economical. Plus, this being Japanese cuisine, you are nearly always guaranteed extra depth of flavor from an ingredient which will provide an umami element into the nabe. Most times this will be in the broth, which frequently are miso, kombu, or soy based. 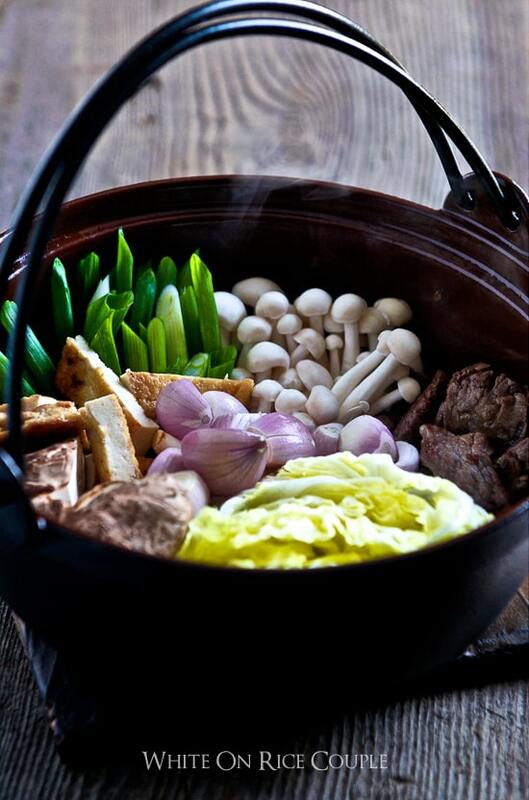 This particularly delicious nabe recipe is for beef sukiyaki. In historical times, both beef and sugar were rare, expensive luxuries in Japan, so of course for those special occasions one wanted to serve the best. Today, for us at home, these are still the best ingredients. Warm food for the soul. Just add rice. Sukiyaki is type of nabe (Japanese hot pot, in case you forgot 😉) where deliciously thin sliced beef is quickly seared, combined with medley of other nourishing and tasty vegetables and other ingredients, then simmered in a broth of sake, soy sauce and sugar. The richness of the beef, highlighted by the sweetness of the sugar combined with a bit of savory umami from the soy sauce and a bit of a punch from the sake, make this is an utter delicious hot pot. Japanese Hot Pots – Comforting One-Pot Meals by Tadashi Ono and Harris Salat- The recipes are fantastic, there are fantastic tutorials for the prep (which isn’t complicated but little traditional twists on how to cut and prepare the ingredients make the nabe that much more delicious.) Even more prevalent in the book is their love for nabe, a truly special cuisine from the hearts and home kitchens of Japan. 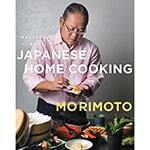 Mastering the Art of Japanese Home Cooking by Masaharu Morimoto – From one of the Iron Chef masters, Morimoto makes the sometimes intimidating Japanese cuisine accessible. 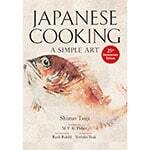 Bringing to life the beautifully simple and flavorful home cooking of Japan. Iwachu Iron Sukiyaki Pan-Large – Made in Japan, this is a perfect sukiyaki pan for 4-6 people. This sukiyaki pan is made by Iwachu, one of the finest manufacturers of Japanese ironware. 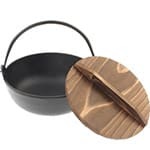 Iwachu Iron Sukiyaki Pan-Medium w Lid – Made in Japan with a Cypress wood lid, this is a perfect sukiyaki pan for 2-3 people. 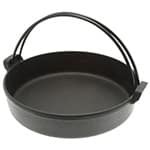 Made by Iwachu, one of the finest manufacturers of Japanese ironware. Zojirushi Electric Skillet – A great tabletop cooking electric skillet. 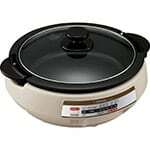 Perfect for sukiyaki and other hot pots. Let everyone at the table get in on the cooking action. 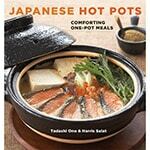 Read more about Japanese cuisine and hot pots at The Japanese Food Report . If you don't have or can't find some of the ingredients below, don't let that stop you from making this. Substitute what you can and like to eat. In a 4 1/2 - 5 qt pot (preferably an enamaled cast iron, but use what you've got) warm pan over medium heat and add fat trimmings. Render fat (if using) for a minute or so, then add beef slices. Try to lay in the slices in a singular layer. Brown each side. Gather the meat to one side of the pan. Arrange shallots or onion, cabbage, green onions, mushrooms, tofu, and noodles into neat clusters in the pan. Add sake, dashi or water, sugar and soy sauce then simmer for 10 minutes. Add Shungiko, spinach, or arugula leaves on top of everything, then cook for 1 minute more. Serve in the pot you cooked it in. One optional way to enjoy this nabe, is to crack and beat an egg in a bowl for each person. As they eat, they can dip each cooked ingredient into the egg, then consume. Eat through all the goodies in the pan, then add the remaining broth into bowls with rice to finish off all of the delicious broth. *Note 1: You can always ask your butcher to slice the meat thinly for you, but for those DIY types, put the meat in the freezer for 2-3 hours to firm it up, then slice it using smooth, long strokes slicing across the end grain. In Japan the beef is usually super well marbled. Not just the Kobe beef either, nearly everything we saw had incredible marbling. If you can, try to find something similar in your area. *Note 2: To slice the cabbage so they absorb the broth well, lay a stack of leaves flat on a cutting board. Starting at the base end, instead of slicing straight down, slice at a sharp angle, right to left (if you are right handed.) Repeat every two inches. first, the recipes are done very well. very easy to follow. i am encouraged to try this dish. i asked santa for a donabe pot for christmas and he didn’t disappoint. gotta figure it out sometime, right? next, i really like your cute little videos. i watched one through and your very good at showing technique not just recipe. i found you just in the nick of time as it’s turning quite cold here. this will definitely ‘warm for the soul’. thanks and i’ll be back. 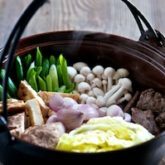 Where can I get a good authentic nabe pot in the states? I live in NYC. Your Sukiyake hot pot recipe looks delicious! Is it possilbe to substitute chicken for the beef? Would I prepare the dish differently? You could do a chicken sukiyaki as well. In the book which this recipe was adapted from, Harris has a chicken sukiyaki recipe as well. The recipe is based a local hot pot in an area of Japan that is prized for their chicken. Process is similar to this beef sukiyaki recipe, but with miso also flavoring the chicken. You could try subbing the chicken in this recipe and we’re sure it will come out nicely, but if you get a chance, pick up Harris Salat and Tadashi Ono’s book Japanese Hot Pots. It really is a wonderful cookbook. Wow, I was searching for a good recipe for Banh Mi and had already decided to try the Caramel Pork Banh Mi. After cruising through your site I stumbled on this Sukiyaki dish, this is one of my 3 kid’s favorite dishes. I just made Sukiyaki a week ago. I don’t have a hot pot so I use an electric skillet on the dining table and have the family help themselves as I cook, the skillet can barely keep up with the demand. Funny you should mention about the konnyaku noodles, I have to have 3 bags of it, one for each kid. My wife and I just get a little taste of the noodles. I need to make it again using sake. My kids don’t care for the raw egg so I use finely grated daikon and shoyu for the dipping sauce. The photos of the dish are amazing, I can practically smell the sukiyaki cooking. I made Sukiyaki today using this recipe and it was delicious! Thank you so much! WOW. Made this for dinner tonight. Very flavorful and yummy. Also quick and easy to prepare. How many servings does this recipe make? Anyone? 4? Can’t find the info on this site. Yes, this generally serves 4 people. I love the pot that you have used to cook this sukiyaki in. Where did you get it from, I suspect Japan. The dish looks delicious, I’m teaching a group of Chefs in a couple of weeks time and I’m tempted to show them this recipe of yours, it looks inviting and simply delicious! For New Year’s eve gathering in the Philippines, we had shabu shabu with a large assortment of ingredients. The only thing is, my sister used store bought ready made soup base and I tasted the artificial flavoring. Years ago, a Japanese doctor friend used to prepare sukiyaki whenever he visited and I would stop him from pouring a lot of sugar into the broth. He must have the mentality from the shogun days before the abundance of cane sugar. Anyway, it’s been ages since I prepared it myself. Now you gave me an idea and inspiration especially in these freezing days in my neck of the woods in the northeast. Thanks and more power to you , Diane and Todd for the year 2010! 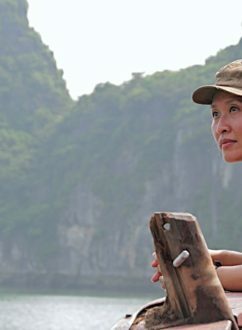 wow – this looks amazing! 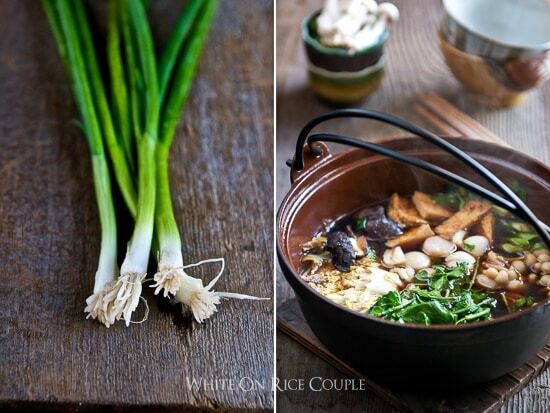 when winter comes around here in Oz I’ll definitely be giving this a go (with gluten free soy sauce) YUM! Looks great. I really need to get myself a proper nabe. I end up making most of my nabe’s in a Le Creuset and while it works just fine it just doesn’t have the same feel. ever since we left san francisco, i’ve never gotten over the sukiyaki from japantown. this is the first time…in a LONG time that i’m reminded how much i miss an authentic hot pot. i’m licking my lips and wishing you were my neighbor. beyond gorgeous. This is such a lovely description of the ceremony of this dish as well as the comfort it brings. The snow is falling this morning—thanks for the warming sentiments and photos. My Japanese host mum used to make this and it was the ultimate comfort food! When I returned to Japan a vegetarian in college, my host mum had absolutely no idea what to do with my request for ‘vegetarian sukiyaki’. So, since my carnivorous ways in the early 90’s ended, I’ve not been able to enjoy one of the best foods Japan has to offer. I”m curious if you think this recipe, sans beef would work just as well? 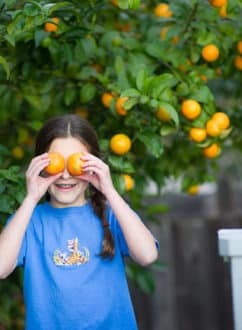 Thanks-for the recipes, and amazing photos. Love it! Mmmm, sukiyaki is one of my favorite dishes and one of the very first dishes I learned to prepare the first time we lived in Japan. I love how every household has its own variation. LOVE that opening collage! My Mama made an American version of this when I was growing up. She didn’t cook much. I can’t wait to try a more authentic version! I’m reading your photo series and praying I can apply it to my photography. How long did it take you guys to become so fabulous at this? Seriously! Photography is the bane of my existence!!! I have been planning to make this but we have not had cool enough weather. It is the best comfort food. You take the most amazing and appetizing photos..
hi guys – the suki-yaki looks insanely good! and i’m not even a fan of suki-yaki or shabu-shabu.. but i basically love all kinds of hot pot dishes and am having fun experimenting with the recipes in the book for sure. happy new year & enjoy mexico! chika – thank you! happy new year to you too! That look so good and so warm!! It’s freezing here in RI. This morning it’s 4 with a wind chill of 12 below!! Brrrrr! I think I need to make another trip to my fave Asian market. Thanks you guys, oh and those bowls are BEAUTIFUL!!! lol. 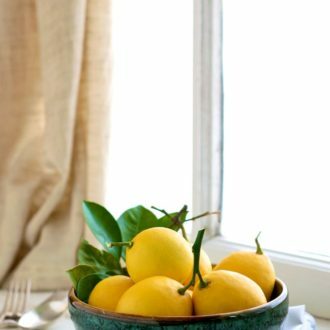 Lisa – yes, aren’t those bowls just BEAUTIFUL?? thanks Lisa! Literally. i adore your blog, i have to attempt to make this! Looks wonderful. I’m inspired to try to make one. Gorgeous! I am thinking to make oden. It does look and sound delicious. I have had shabu- shabu in Tokyo. Although it was 19 years ago I can remember every detail of it. Dear Todd & Diane – you are torturing me AGAIN, that is the most beautiful sukiyaki-don I’ve ever seen! I usually do steamboat over winter but this sounds like a great idea as well. Love the photos! Oh, man! This is killing me. My Japanese homestay mother is an amazing cook, but my very favorite thing that she makes is sukiyaki. She would make it for my birthday every year because she knows how much I love it. When I left Japan I went cold turkey—because I knew no other sukiyaki would be as good and it would just make me sad (I actually couldn’t eat Japanese food for a couple of years, brought back too many memories of what I had left behind). I haven’t had sukiyaki in eleven years! But this one, this one I want! I bet you guys would knock it out of the park—and it’s so gorgeous. 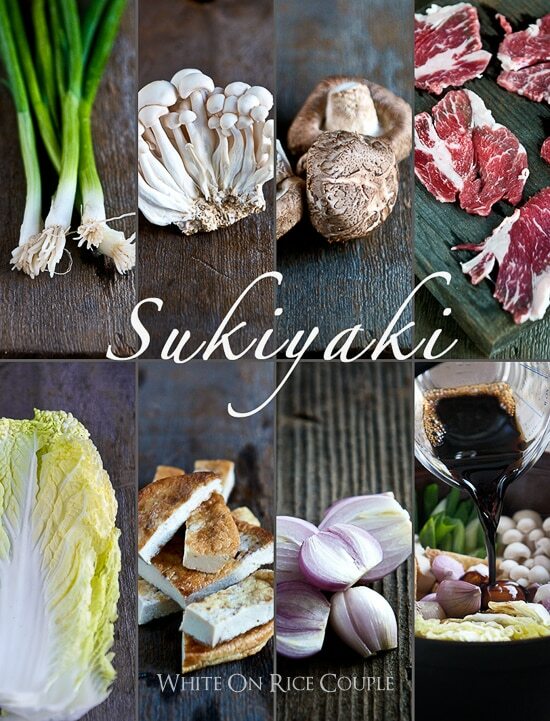 Dang, now I’m craving sukiyaki (and it’s all your fault:-). Guess I need to hop a plane to get my sukiyaki fix—LA or Japan! Tea_austen – looking forward to your arrival! 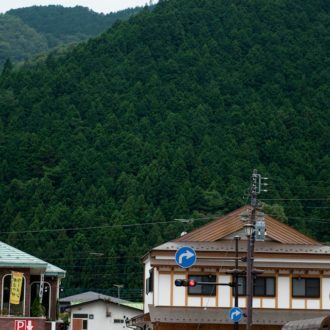 We’ll be excited and ready for you with plenty of warm sukiyaki! I’ve never made a hot pot. Never even heard of it. Love your photos! This dish looks soooo good, I’m definitely going to try it. Love the collage. I feel warmer already! Kristen – heard that you’ve go so much snow that schools are cancelled, wow, now that’s cold!! Glad to to know that the sukiyaki is warming you up a bit!